Grandparents have often served as a secondary support system for families, but today more than ever, many grandparents have become the primary caretaker of their grandchildren, specifically for those who have a mother in prison. 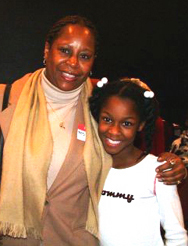 More than 50 percent of children who have an incarcerated mother reside with their grandparents. Big Brothers Big Sisters of Metro Atlanta has seen the effects of this through their Amachi program: most of the children they have matched reside with a grandparent. The Healthy Grandparents program at Georgia State University, which provides support for grandparents who are raising grandchildren, has been a particularly helpful source of referrals. These grandparents “have gone beyond those primary needs and are beginning to think about what’s going to happen to the children down the road and recognize that a mentor can help them to have a successful future,” said Charcella Green, vice president of program services for BBBS of Metro Atlanta. This is not always the case for many of the other caregivers with whom the agency works. “For most of the families that we work with, they are so busy trying to make things comfortable and safe immediately that they don’t spend a whole lot of time thinking about the future,” said Green. As of July 31, 2004, 37 of the agency’s 118 matches involve children referred by Healthy Grandparents. The remaining children were referred by Prison Fellowship’s local Angel Tree program, which gave the agency a list of 900 children. After weeding through the list, BBBS of Metro Atlanta is now ready to bring 150 of those children on board. Eager to locate more children, BBBS of Metro Atlanta has developed a partnership with the Atlanta Housing Authority. The two agencies sent out a joint letter to all the tenants’ association presidents across the city. Then BBBS of Metro Atlanta followed up with different associations, explaining the Amachi program personally and in detail. In addition, the Atlanta Housing Authority provided BBBS of Metro Atlanta with a list of 300 names of grandparents who are raising children. As with the tenants’ associations, the agency called the caregivers to discuss the Amachi program in detail. 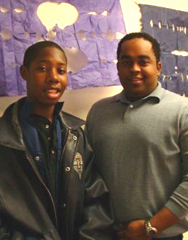 BBBS of Metro Atlanta has had less success recruiting children during prison visits. Green said it would be extremely helpful if the agency could collect information on the children of inmates when the parent first enters the prison system. Finding the children is just the beginning. The metropolitan Atlanta area is fairly spread out and public transportation can be a logistical nightmare for the caregivers, many of whom are seniors who are raising multiple small children. Consequently, BBBS of Metro Atlanta has had to adjust their processes. For the agency’s other programs, home interviews are done rarely, if ever, and most of the time training is completed in pre-scheduled groups. This is not the case with Amachi. Most of the interviews are done on an individual basis at the caregiver’s home and the agency works with them to schedule trainings that are convenient.